Little Weirdos: Mini figures and other monster toys: Matutano Dinossauros: Kaiju-like dino minis from Spain! 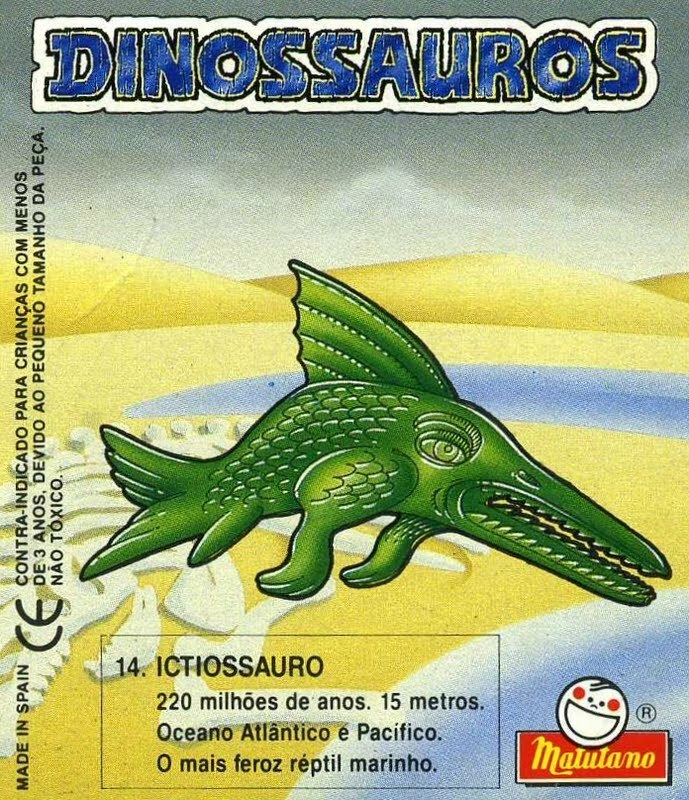 Matutano Dinossauros: Kaiju-like dino minis from Spain! These wacky dinosaur minis were a mystery to me for years. 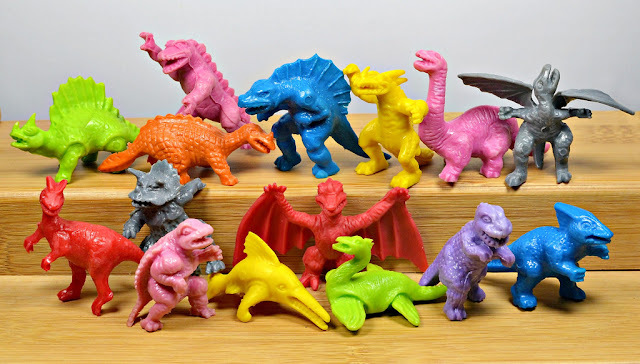 I would regularly see them turn up in lots of Monster in My Pocket or other minis, usually from Europe, but I wasn't able to tie them to a specific toy line. 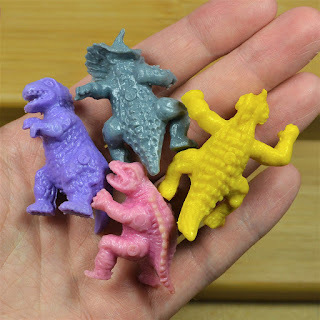 Eventually I learned that they were given away with products from Matutano, a snack food company in Spain and Portugal that has offered many toy premiums over the years (including some of my favorites, Matutano Monstruos). 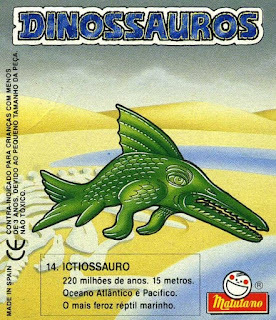 Further research revealed the specific name of the set to be "Dinossauros," released in the early 1990s -- probably 1993, from what I was able to find from some Spanish-language Googling). 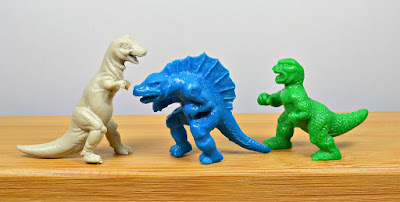 Probably my favorite thing about these figures is that they make no attempt to be historically accurate depictions of the dinosaurs they're supposed to be. Instead, they look more like an amalgam of dinosaurs and kaiju, which is awesome. Not really good for teaching kids about dinosaurs, but good for setting the figures apart from the many other sets of dinosaur minis that have been released over the years. Here are some individual shots of all 15 Dinossauros. They are shown in the order of their assigned numbers (top row: 1-5, middle row: 6-10, bottom row: 11-15). I'm not quite sure what my favorite is, but numbers 1 and 2 are definitely up there. Gotta love that bipedal triceratops! Finally, here's a comparison shot of a Dinossauro with the MIMP T-Rex and a Topps Dino Toy. Matutano Dinossauros are not necessarily of the highest quality--many figures have some noticeable flashing and some of them won't stand up no matter how hard you try to make them--but what they lack in that area they definitely make up for in charm. I like 'em so much I hunted down the full set! What do you think about these little weirdos? Have you come across any in your collecting? Now that I finally know what these are I'm dying to get hold of some more. Yeah, they are pretty cool - worth hunting down! I've got some that i can trade. Im looking for bad eggz. If anyone wants to trade i can send pictures.